The Kid Paul remix on side D is a classic. Underplayed linear tech/tech trance with cool guitar/synth motif running underneath gated top lines modulating just enough to play with your mind. Ace! PS Don't bother with the other sides!!! Was really pleased to see a comment on 'hispanos in space'.it is for me one of J&S's finest moments.fairplay to tonymasud for highlighting what a gem this track is. The other reviewers are not kidding about "Follow Me!" Just heard it for the first time a few moments ago. One of the most well put together pieces of music I've heard, electronic or otherwise. "Right In The Night" is an excellent track in its own right as well with an unforgettable acoustic melody. Follow me is such an epic tune! Just heard it again after many years! Wish there was more like this! Best techno track ever on B-side... "follow me"
This was my actual reason for buying this record. 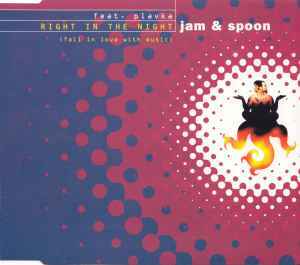 If you went dancing anytime in 1993-4, you most likely heard RIGHT IN THE NIGHT, Jam & Spoon's biggest hit. And it's a perfectly catchy tune, from Plavka's vocals to the acoustic guitar riff. Its bassline spawned a thousand cheesy trance sons, but it still sounds gripping here. The instrumental version places greater emphasis on the guitar, making it more flamenco than ever, even down to the castanets in the background. But it's "Follow Me!" which garners more attention, with its pure trance and the deep beat that lends itself to a hypnotic state, until the horns starts sounding about 1/3 of the way through, signalling an imminent change in direction from the minor key to a major one, as well as a significant uptick in the beat, going all out rave-strength for its final third (with a minute's worth of comedown). That track might be even more right in the night.